A determined seven-year-old girl escaped a potential kidnapping attempt at a Walmart in Bremen, Georgia, yesterday. A Walmart surveillance video taken at the time of the attempted kidnapping shows the child’s escape. A video clip of the incident and video report from Fox News is available at the end of this article. Bremen police have confirmed the arrest of Thomas A. Woods, a 25-year-old man from Austell, Georgia, as a suspect in the case. Woods was previously convicted of voluntary manslaughter and was out on parole after serving seven years in prison. 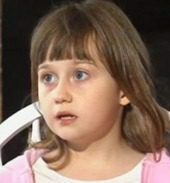 The child, Britney Baxter, was browsing in the toy aisle while her mother was in another aisle picking up strawberries. The distance between the two has not been reported at this time. Reports indicate that the man approached the second-grader and attempted to start a conversation. Then the child was grabbed, lifted and carried away. The girl reports that she struggled, kicked and screamed. The man then released the girl and ran away. Surveillance cameras in Walmart’s parking lot caught the man leaving in his car. Police pulled Wood’s car over in nearby Tallapoosa, GA, and placed him under arrest. He denies being at the Walmart. Talking about the attempted abduction, Britney said she was taught in school to try to get away.